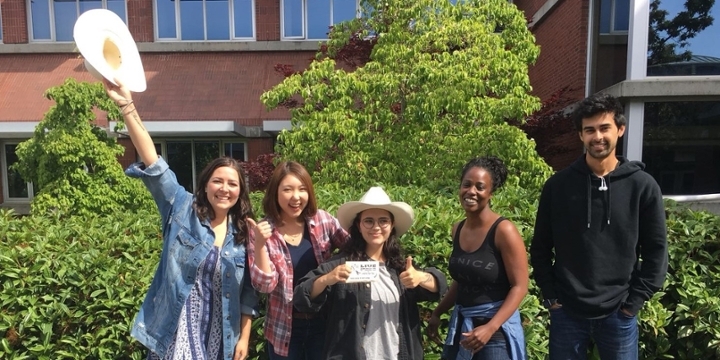 CSSI collects stories and photos of some of the great things Gustavson students, profs and staff do, and we publish them in our annual Year in Review reports. We hope you enjoy them. We bring the world to Gustavson classrooms, and share Gustavson with the world. We love to celebrate Gustavson's creative, smart and sustainable students and alumni. Check out our weekly Communique for news and stories! We’re one more way that Gustavson steps up to make the world better. At Ideafest 2018, Chief Anne Mack, Judith Sayers, Johnny Mack and Matt Murphy described the Toquaht Nation's new framework for assessing economic development possibilities using environment, economy, culture and community as the markers. View more CSSI videos on the Gustavson School of Business YouTube channel. Bart Simpson talks to CSSI - Filmmaker Bart Simpson talks to Gustavson's Centre for Social and Sustainable Innovation about film, business and social responsibility. Mission Impossible? Not at Gustavson - new students create sustainable, socially responsible business ideas in three hours. Faces of UVic Research: Monika Winn - our director explains the ways in which business can be made more sustainable, and explains that the public demand for large companies to have environmental transparency leads CEO's and businesses to become more sustainable. The world looks different from here - a short trip, through the students eyes, of the unique experiences they have with the Gustavson School of Business in class, on exchange overseas, on internship and most importantly having fun together.